This book will show you how to build a sustainable reputation risk management framework and how to handle your next reputation risk crisis. It will help you identify ways in which reputation risk can impact bottom line, and then show you how to set up a framework for turning that risk into an opportunity for good, sustainable business. Reputation risk is a strategic risk and a potentially material risk, all the more so in the "age of hyper-transparency". This needs to be clearly understood by both management and boards of directors so that the people tasked with reputation risk have the support they need to align their reputation risk management with business strategy and planning. The Reputation Risk Handbook provides a clear framework to identify, manage and resolve reputation risk, including: a clear description of what reputation risk is and how it fits within the pantheon of corporate and institutional risk and strategic management; a practical process for creating early warning systems and on-going management and monitoring of reputation risks; techniques for aligning reputation risk management with business strategy and business planning; several case studies, including examples of when reputation risk management has gone wrong; examples of how to manage specific reputation risks successfully or deal with a reputation risk crisis. 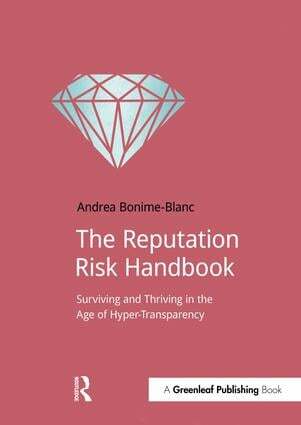 The Reputation Risk Handbook is not just for practitioners – those who manage risk and reputation directly – but for those who have oversight of risk management – namely boards, their committees and the c-suite. In addition to a framework for practitioners, the book provides specific suggestions for boards, including questions to ask management and what to look for within their organizations.